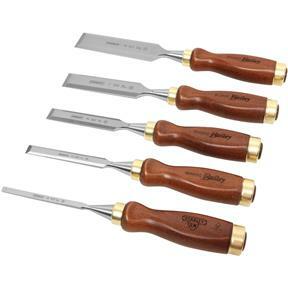 This five piece Bailey chisel set is perfect for the serious woodworker who demands perfection. Designed with stained beech handles and an upgraded brass ferrule, these high-quality chisels have pre-honed micro bevels and an improved blade finish with new grinding centers. 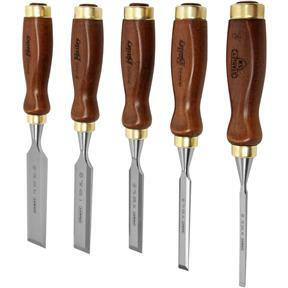 Manufactured in Sheffield, England, Bailey Chisels are known for unsurpassed quality. This 5 piece set includes the following sizes: 1/4" (6mm), 1/2" (12mm), 3/4" (19mm), 1" (24mm), and 1-1/4" (32mm). These were a great entry level purchase of chisels. I'm beyond pleased with these after putting a good hone on them. They are now sharp enough to shave hairs and they hold the edge fairly well. I'm truly happy with this chisel set. With some basic sharpening these chisels are shaving sharp. Each one took a great edge even better than expected!